This is the application of key elements of Models of Communication to PowerPoint presentations. Standard do’s and don’ts have been classified as being media, message or feedback centered for better analysis. 1.1) Do use a big enough font size. 1.2) Do use fonts that are available on most computers. 1.3) Do use bullets instead of paragraphs. 1.4) Do use the same background for all your slides. 1.5) Do use the same font throughout your presentation. 2.1) Don’t put too much text on one slide. 2.2) Don’t rush your slides. 2.3) Don’t use hard to read color combinations. 2.4) Don’t use too many animations or other special effects. 2.5) Don’t use too many slides. 3.1) Do adjust the message to the audience. 3.2) Do use handouts to supplement your presentation. 3.3) Do give out fill-in-the-blank handouts before the presentation. 3.4) Do give detailed handouts after the presentation. 3.5) Do know more about your topic than what you are presenting. 3.6) Do pick an organizational system (analysis, cause and effect, chronological, deductive, inductive, order of importance, or sequential). 3.7) Do try to pick a topic and examples the audience needs and/or cares about. 3.8) Do use key words. 3.9) Do use vocabulary the audience can understand. 3.10) Do study PowerPoint presentation systems such as the Assertive Evidence System, Presentation Zen, and Slide:ology. 4.1) Don’t close the presentation at the end but let the audience ask questions. 4.2) Don’t over-organize information i.e. use too many subheading levels. 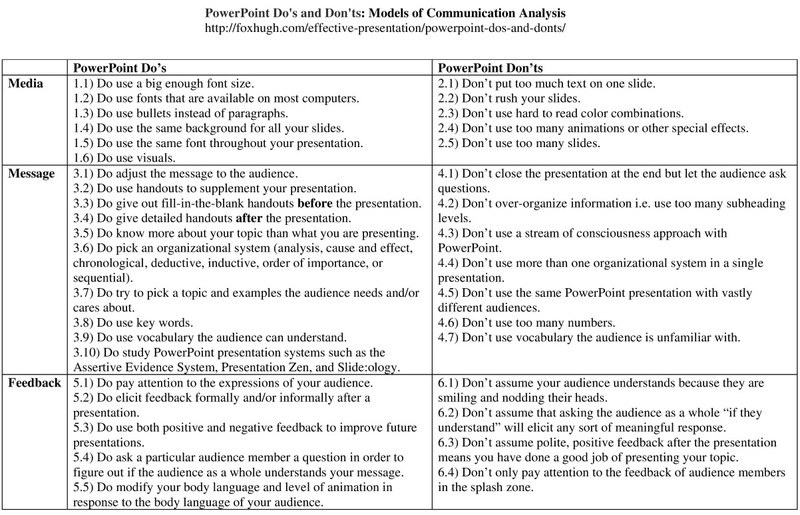 4.3) Don’t use a stream of consciousness approach with PowerPoint. 4.4) Don’t use more than one organizational system in a single presentation. 4.5) Don’t use the same PowerPoint presentation with vastly different audiences. 4.6) Don’t use too many numbers. 4.7) Don’t use vocabulary the audience is unfamiliar with. 5.1) Do pay attention to the expressions of your audience. 5.2) Do elicit feedback formally and/or informally after a presentation. 5.3) Do use both positive and negative feedback to improve future presentations. 5.4) Do ask a particular audience member a question in order to figure out if the audience as a whole understands your message. 5.5) Do modify your body language and level of animation in response to the body language of your audience. 6.1) Don’t assume your audience understands because they are smiling and nodding their heads. 6.2) Don’t assume that asking the audience as a whole “if they understand” will elicit any sort of meaningful response. 6.3) Don’t assume polite, positive feedback after the presentation means you have done a good job of presenting your topic. 6.4) Don’t only pay attention to the feedback of audience members in the splash zone. 1.0) What are the do’s mentioned in the video? 2.0 ) What are the don’ts mentioned in the video? Think about the content of your presentation. Name one point the video made. Was the point about media or message? YOU CAN SPICE UP YOUR POWERPOINT PRESENTATION WITH SOME SPECIAL EFFECTS!